In this session, see how everything fits together, without slides, just code! We think this one is a great opportunity to learn more about this Oracle resource from one of the people in charge of this powerful tool. Stop thinking now, go to the ticket’s platform, and get ready for this session! 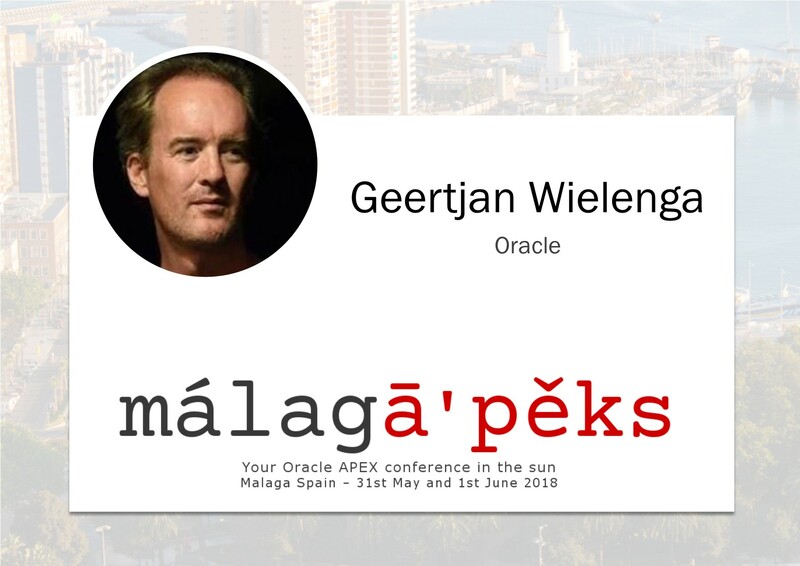 Don’t forget to follow Geertjan at his Twitter account (@GeertjanW), and remember to check out our own Twitter channel at @malagAPEX to get the latest news about the #MALAGAPEX18! You still have some more hours to get your Early-Bird tickets today, so that’s why we’ve chosen today for sharing the Agenda for #malagAPEX18!! We haven’t filled all the gaps yet, but we want to let you know about most of the sessions and the great quality of speakers driving those talks. We’ll be linking these entries as soon as we publish the corresponding abstract’s entry with more details, so feel free to check this post in the future to get the full picture! Oracle JET: No Slides, Just Code! Feel free to comment to us how much do you like this conference agenda!! 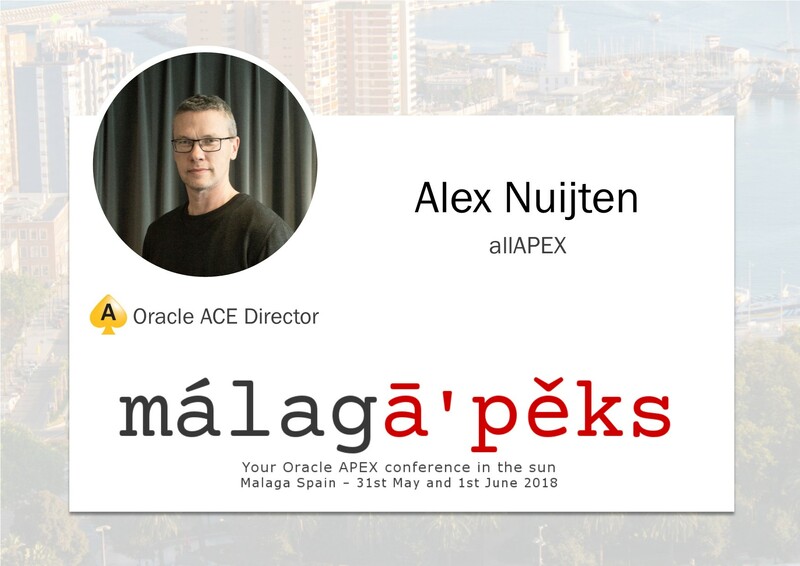 We’re so happy of having such great speakers, and we really want to make this initiative of spreading Oracle technologies, specially APEX, here in Spain! Listen to Andrzej! Talk to APEX ! Eat pizza ! Today, we want to present the session by Andrzej Nowakowski titled: “Natural Language – modern user interface”. But let’s learn a bit more about Andrzej first. Developers since decades have used the same types of data input components like text fields, select lists, date pickers, etc. Although the style of interfaces is changing (other colors, other shapes or total other design styles), they are still standard components. If the application must interact with public users or end users that can’t use a keyboard, a better solution is to use more natural interface. Until very recently, there wasn’t any alternative to standard GUIs. But this has now changed and you can build applications with modern, natural interfaces. One of the most popular interfaces is the voice recognition from Amazon… called – Alexa. With Alexa, you can build natural voice applications that offer users a more intuitive way to use. In this presentation, we will build a real-world APEX application to order Pizza via the voice interface. To build this solution we will only use APEX with ORDS and Alexa Kit. You shouldn’t be missing such a great opportunity to integrate Alexa and APEX. That’s why you have to follow our Twitter account (@malagAPEX) and keep the track of the hash #MALAGAPEX18! As we continue talking about our speakers, we want to focus today’s post on Niall McPilips. Niall has been developing using Oracle since Oracle V5. He has been using Oracle PL/SQL Web technologies since 1995 and Oracle APEX since 2005. Niall has developed a number of large, multi-lingual applications for multinational companies and organizations all over the world. Several of these receives tens of millions of page views per year. Niall is a strong believer in APEX solutions because of their stability, scalability, and rapid development speed. Niall is also the organizer of the Swiss APEX Meetup group. This case study will describe the approach and challenges faced when overhauling a 14-year old image library of over 40’000 photos. The new version was developed using Oracle APEX 5.1, Oracle Multimedia, Oracle Text and PL/SQL. Issues addressed include automatic extraction of image metadata to facilitate searches and image description, automatic resizing of images using Oracle Multimedia, customization of APEX reports to produce a modern presentation format for the photo library. We really look forward to attending Nial’s presentation. 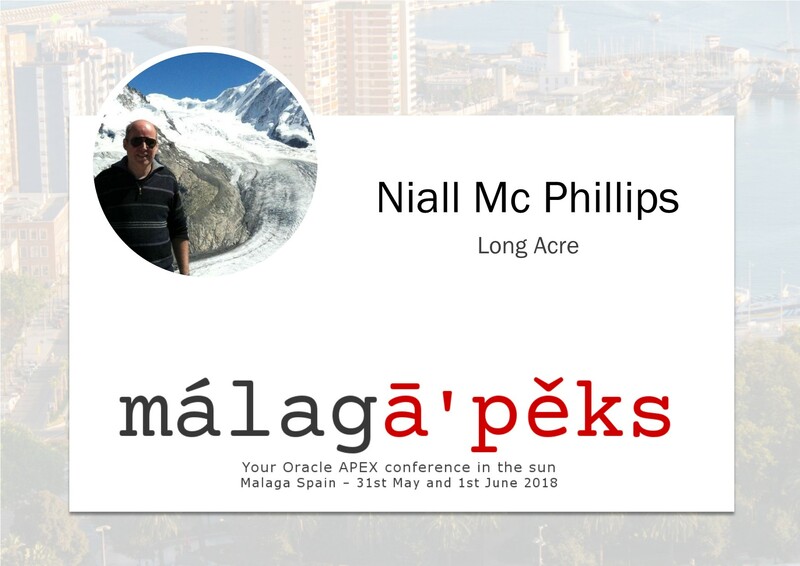 Meanwhile, you can follow his Twitter account @Niall_McP, and don’t forget to stay tuned to our Twitter account (@malagAPEX) to get the latest news on #MALAGAPEX18! Here we have a new blog entry about another of our great speakers. In this post, we’d like to talk about an Oracle ACE Director and European Oracle User Group Ambassador: Heli Helskyaho. She is the CEO of Miracle Finland Oy and an Ambassador for EOUC (EMEA Oracle Users Group Community). Heli holds a Master’s degree (Computer Science) from the University of Helsinki and she has specialized in databases. At the moment she is working on her doctoral studies, researching and teaching at the University of Helsinki. Her research areas cover Big Data, multi-model databases, schema discovery and methods and tools for utilizing semi-structured data for decision making. Heli has been working in IT since 1990. She has held several positions but every role has always included databases and database design. Heli believes that good database design and good documentation reduces performance problems and makes solving them easier and we do not disagree with this. A great APEX application starts with a great database design. Appart of being an Oracle ACE Director and a very frequent speaker at many conferences, she is the author of Oracle SQL Developer Data Modeler for Database Design Mastery (Oracle Press 2015) and a co-author of Real World SQL and PL/SQL: Advice from the Experts (Oracle Press 2016). Everybody is talking about Cloud. How does the Cloud change my work as a database designer? What should I know and what new to learn? In this session, we will talk about these concerns and design a small database to the cloud using Oracle SQL Developer Data Modeler and Oracle SQL Developer. You can check her Twitter account at @HeliFromFinland. She’s very active, and always sharing interesting content with the community. Stay tuned to our Twitter account (@malagAPEX) to get the latest news about #MALAGAPEX18! Today, we’ll put our focus on Roel Hartman, to learn a bit about his background and the talks he’ll drive at #MALAGAPEX18, the upcoming 31st of May and 1st of June. He started a long time ago using Oracle RDBMS 5, Oracle Forms 2.3, RPT/RPF and Oracle*Case 4.5. Since a few years, he has been focussing mainly on Oracle Application Express. Roel has been a speaker on UKOUG, OOW, Collaborate, ODTUG’s KSCOPE and a number of local Oracle User Groups. Within ODTUG he acted as the APEX Content Lead for the Kscope14 and KScope15 conferences and is a member of the Board of Directors. He keeps an (APEX-related) blog on http://roelhartman.blogspot.com. In June 2009 Roel received an Oracle ACE award and in August 2010 he was appointed Oracle ACE Director. Roel was a co-writer of the “Expert Oracle Application Express” and “Oracle Application Express for Mobile Web Applications” books. Roel is Director at APEX Consulting in The Netherlands. Today, we want to highlit one of the sessions from Roel, titled as A Deep Dive into APEX JET Charts. Declarative JET integration in APEX. Use other JET components in APEX. 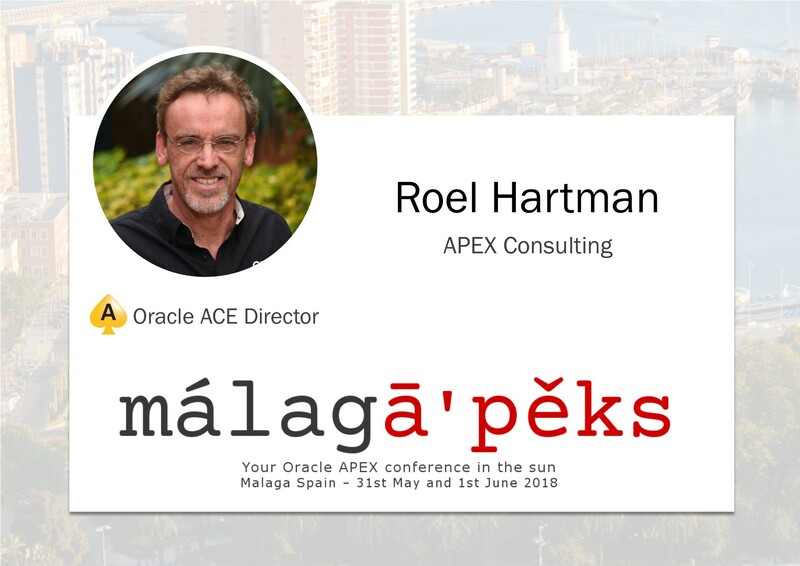 Something else you must know is that Roel is a very active user at twitter, so feel free to follow his account at @RoelH, and remember to check our own twitter channel at @malagAPEX to get the latest news about the #MALAGAPEX18! In this post, we’d like to present you to the one and only dancing ((#ougn18)) APEX developer Alex Nuijten. This very well known speaker, awarded the Oracle ACE Director membership back in August 2010, is an independent consultant (allAPEX), specializing in Oracle database development with PL/SQL and Oracle Application Express (APEX) and Alex is a member of the Smart4APEX team. Besides his consultancy work, he conducts training classes, mainly in APEX, SQL and PL/SQL. Alex has been a speaker at numerous international conferences, such as ODTUG, Oracle Open World, UKOUG, IOUG, OUGF, BGOUG, OGH APEX World and OBUG. For his presentations, Alex received several Best Speaker awards. He wrote many articles in Oracle related magazines, and at regular intervals, he writes about Oracle Application Express and Oracle database development in his blog “Notes on Oracle” (nuijten.blogspot.com). Alex is also a co-author of the following books “Oracle APEX Best Practices” (published by Packt Publishers) and “Real World SQL and PL/SQL” (published by Oracle Press). Creating beautiful applications with APEX is easy, especially after the introduction of Universal Theme. It is easy to follow the wizards and drop SQL and PL/SQL all over the place in your application thereby creating a maintenance nightmare. When a table is changed, which pages are affected? How can you easily find out? Getting the structure of your application right requires a method to follow. In this session, I will share my thoughts on structuring your APEX application. This session will focus on just that: build robust applications; leverage views, packages, instrumentation, etc. If you don’t want to miss anything of what Alex has to say, don’t forget to follow his Twitter account at @alexnuijten. For sure, you all will enjoy the talks of this dancing APEX developer. Don’t forget to stay tuned to our Twitter account (@malagAPEX) to get the latest news about #MALAGAPEX18! 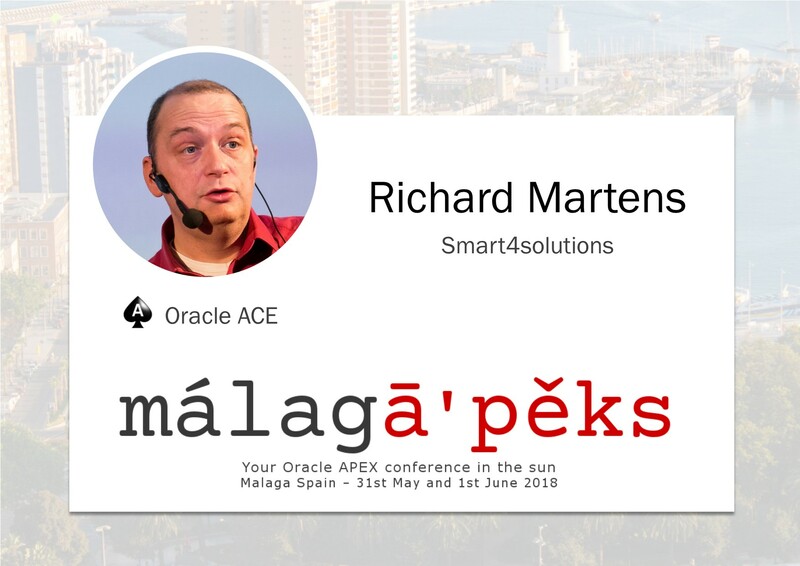 We’re getting close to the #malagaAPEX18 event in Málaga (Spain) next 31st of May and 1st of June, so for all of you who haven’t made up your mind and got your tickets yet, Richard’s session will help you decide. Not all the sessions are decided yet, but we can start talking about some of the speakers we know for sure by now. Today, we’d like to talk about Richard Martens. Richard has been involved in information technology for more than 15 years. He started as a web developer using the Oracle database simply as a data store. He has also been responsible for major European multilingual websites and has been working with the Oracle database since 2000. During those years, he developed himself using a multitude of technologies and specialized in PL/SQL and Oracle APEX. With APEX, he combines the things he loves most: the Oracle database and web technologies. Apex offers several ways to validate user input. This session shows ways to do just that bit extra to make your application foolproof yet keeping it user-friendly. After the session, you’ll know how to do server-side validation, database validation and client-side validation. Few more days to get your Early Bird tickets! 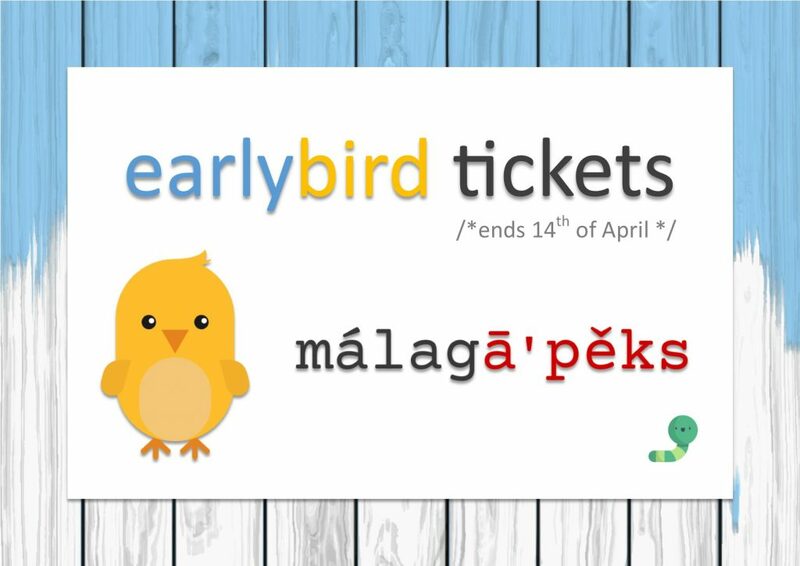 We know some of you’re still thinking about coming to málagā’pěks next 31st of May and 1st of June, and the Early Bird discount for the event is about to expire. However, we are really excited about this first-APEX-conference in Spain, and we’ve been able to convince our main sponsor to extend the special price until the end of April! A bit off the record, we want to let you know that the abstracts quality is very high, and even the Core Track will be led by top speakers, very well known by the community. Furthermore, every single ā’pěks developer knows that we’re about to get a new ā’pěks version coming out this year, 18.1, so we recommend not to miss an opportunity to know a bit more about what’s coming (very) soon. Don’t wait much longer, and get your tickets to assist as soon as you can! Very soon we’ll be sharing with you more details about speakers, the venue and Malaga city, so join us to be part of a brand new beginning, and don’t miss anything by being tunned to our twitter account! Two weeks left to get an Early Bird ticket! We’re getting close to the málagā’pěks event, and now we are only two weeks away to get an Early Bird ticket!! For about € 100 you’ll have access to a two days event full of ā’pěks, at a great venue in Malaga (Spain) the next 31st of May and 1st of June of this year. If you want to take part of this event, don’t wait any longer and go to the booking tickets system to get yours and we’ll be waiting for you at the capital city of the sunny Costa del Sol!